Over the course of the past few months, I’ve fallen deeply in love with rosehip seed oil. 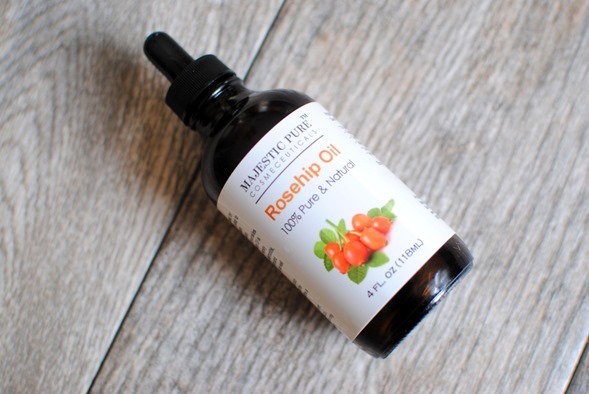 My sister first introduced me to rosehip seed oil when I was pregnant and looking to swap some of my previous beauty favorites for more natural products. 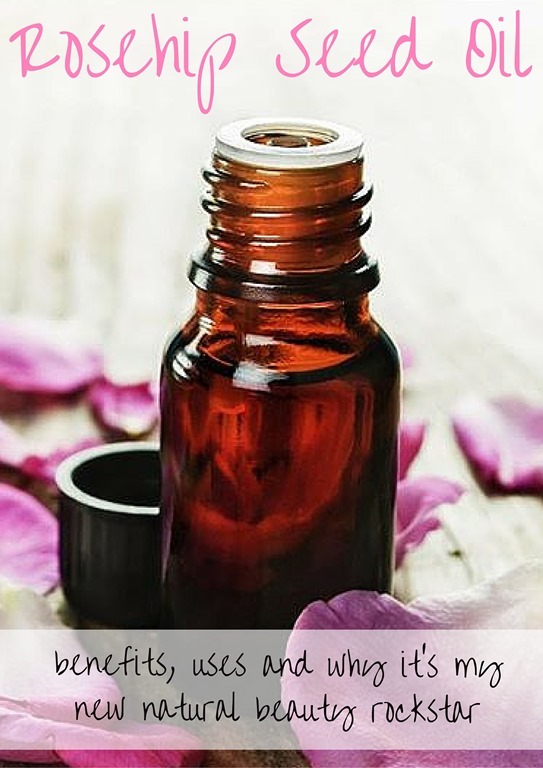 One of her girlfriends swore by it as the “best makeup remover ever,” but after a little bit of research, I realized rosehip seed oil is praised by many for a myriad of reasons, namely its ability to reduce fine lines and wrinkles, correct dark spots and hydrate the skin in a natural way. Ever since I started professing my love for this inexpensive yet completely wonderful addition to my beauty regimen, I’ve received a bunch of questions from you guys ranging from how exactly I use it and what it is to whether or not it makes me break out (<— nope!) and more. “Rosehip oil” is also the most popular search term on the blog right now, so I figured a post dedicated to rosehip seed oil might be of interest. Let’s dive right in, shall we? Rosehip seed oil is harvested from the seeds of rosehip bushes, predominately grown in Chile. It is full of vitamins (especially vitamin E and vitamin A), antioxidants and essential fatty acids (linoleic and linolenic acids), all of which are known rockstars in the skincare industry. Rosehip seed oil is full of rejuvenating properties like vitamin C and lycopene and safely repairs the skin’s surface, restoring elasticity and protecting against stressors that may lead to wrinkles. It contains natural trans-retinoic acid (a derivative of vitamin A), which is commonly used in anti-aging products and praised for its ability to increase skin cell regeneration, reduce the appearance of scars and dark spots and fight acne. Rosehip seed oil is also known for its moisturizing capabilities thanks to the high essential fatty acid content in the oil which quickly penetrates the skin without leaving it greasy for extended periods of time. It is considered gentle enough for daily use and can be blended with lotion, other oils (like coconut or grape seed oil) and moisturizers. How Do I Use Rosehip Seed Oil? I also use it as eye makeup remover. After I wash my face, some mascara or eyeliner inevitably remains on my eyes, so I wipe this stuff around my eyelids and under my eyes to get rid of any remaining black streaks. Rosehip seed oil also works well as body oil! Though I typically reserve it for use on my face, I’ll also occasionally rub it into dry knuckles and elbows (especially during the winter months). I’ll also rub it into my hands, lips and knees if they’re feeling particularly dry. What Changes Have I Seen Since Using It? I began using rosehip seed oil last summer but started really using it as a pivotal part of my skincare routine beginning this past fall. Since then, I’ve seen a marked improvement in the dark spots on my skin which, for me, is HUGE. I’ve splurged on dark spot removing creams and serums and rosehip seed oil is the ONLY thing that has made a difference in reducing dark spots on my face. WOOP! I’ve also seen an improvement in skin clarity and can honestly say the oil has in no way caused breakouts for me, which was probably my biggest concern when it came to rubbing oil all over my face. Within the past month, Ryan began using it in place of his facial moisturizer and was really concerned about breakouts caused by the oil. He hasn’t had any occur either and said he’ll definitely continue using it and loves the way it hydrates his face and sinks into his skin within minutes. And I know this is a little weird, but I feel like it gives my skin a little “glow” when I apply it. This could be all in my head, but I love the dewy look the oil gives my skin. If I’m going to apply makeup after applying the oil, I usually rub it into my skin (I just use my fingers to apply it) and wait a few minutes for it to absorb before applying primer, etc. 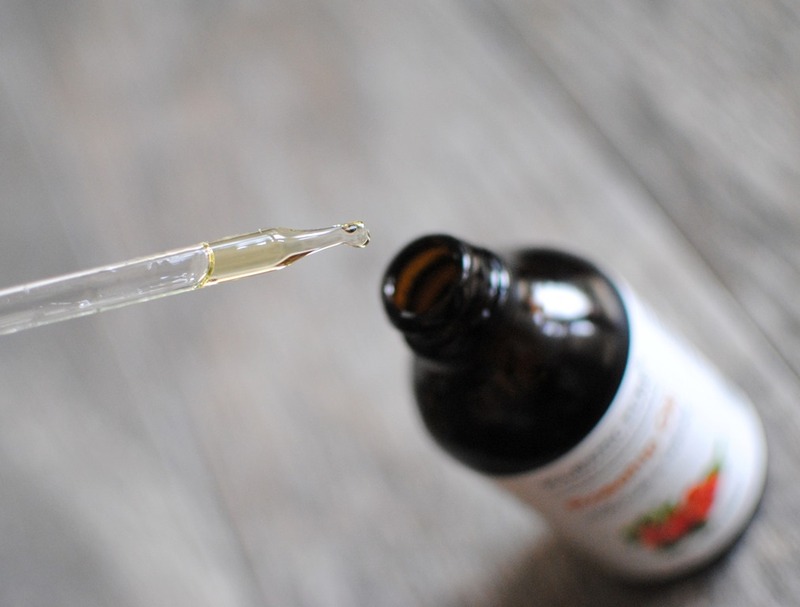 Many expensive beauty products contain rosehip seed oil, but I find that purchasing pure rosehip oil is the most affordable way to go. You may also find rosehip seed oil (or other beauty products containing rosehip seed oil) at Ulta, Sephora and even Whole Foods. What are some natural beauty products/remedies you swear by? Please share some of your favorites! I’m always on the lookout for new natural beauty finds! Love this post! I am pregnant and from what I read there is some concern about using rosehip seed oil while expecting due to the high natural retinol (Vit A) content – does anyone know about this or have used while pregnant? Thanks! I am looking forward to trying it at some point. Love the glow it gives me!!! I’ve started putting some on my legs after shaving as well, since it’s ridiculously dry this winter. Love it! I’m glad you love Rosehip oil! I’ve been using it for years in my skincare routine and I just love how it brighten and slightly firm the skin. I love argan oil (primarily Josie Maran’s Argan Oil Light). I also use an Argan Oil Therapy from DPHue as a hair protectant–it helps speed up dry time and leaves my hair super soft— and use their Apple Cider Vinegar hair rinse when my hair needs a good cleanse. Thank you so much for sharing! I love using natural products on my face. I currently use coconut oil as a makeup remover (it get eye makeup off better than any chemical product). Depending on the weather though I do not always love it for a nighttime moisturizer. I LOVE Vitacost.com and when I looked it up on their website it is only $5! I will be trying this! Thank you for sharing! P.S. What do you use for daily face sunscreen? Thanks for a wonderfully informative post! Hi Katrina, I know this is months late but I just found this post! As a dermatology student, do you have any recommendations for a safe and natural sunscreen or SPF product? I’m so glad you shared this beauty secret! I used to use Argon Oil on my face, and loved it, but then saw an earlier post about Rosehip Oil and ordered it at your suggestion. The two are very similar, but I don’t think I’ll ever go back to using face lotions again. I LOVE the dewey look gives my complexion and I feel like I wake up looking really fresh and glowing. I’m so glad you shared because you have made a rosehip-oil lover out of me. I love that you mentioned pumpkin seed oil! I used to oil cleanse and pumpkin seed oil was my oil of choice! I’ve never run across anyone else who’s even heard of it! I need to go back to that method of cleansing – it was wonderful! I purchased the Rosehip See Oil you recommended from Amazon and I love it!!! I’ve replaced my eye cream with it and for the most part my facial moisturizer. I also get really dry and itchy legs (especially during the winter) and this is the only thing that actually helps – which is a life saver! We are trying to have a baby and I am also wanting to swap out some of my beauty products for more natural alternatives, do you have any other swaps you would recommend? Ordering some of this today! I can’t wait to try. Thanks for posting all about it. I’m curious to try this out! Was this safe to use while you were pregnant? I’m currently pregnant and I know there are some oils that you shouldn’t use so I’m just curious. I also was curious about any other natural products you would recommend? I’ve been trying to switch everything over to more natural products over the last 6 months or so and am always looking for recommendations. It is safe for pregancy. It does contain natural derivitives of vit. A as she pointed out, but it is not concentrated enough to cause any harm. I also began cleaning up my products and the oil she features is a great starting point! I use this oil as well (got mine fom Whole Foods) and love mixing it with barberry fig seed oil (its similar to argan oil but the vit. e levels are much higher making it a rockstar product as well!). I have not experienced any breakouts with them at all. Lots of experimenting to do when switching products, but it’s well worth it. I bought the Majestic Cosmeseuticals 110% Pure and Natural Rosehip Oil on Amazon and received it yesterday. The oil is YELLOW…Bright, bold yellow…is this normal? You’re does not appear to be yellow in the picture you shared. I bought some on your suggestion too (although a different brand)! Mine it bright yellow too and definitely dyes my skin until it sinks in, anyone else experience that? Same here! Its dying my skin orange! Is this normal? I love that you are featuring this oil! I use it as well (my bottle came from Whole Foods and is orange in color as it’s cold pressed). I had a lot of health problems a few years back and worked hard to clean up my beauty and make up routine over the years. I use the oil you featured plus Barberry Fig Seed Oil and my skin has never looked better (and yup – no breakouts!). I also worked hard to clean up my make up – went through more than a few duds which was spendy – but eventually found a bb cream I love from beauty counter (don’t know if you saw it, but Lauren Conrad and Goop both featured it recently). I even started selling it because I loved it so much and wanted discounts, lol. Good luck on your skin care journey and thanks for spreading the word on natural skin care! I have more info on my blog but if you are interested in trying anything out let me know – I’d love to send you some items to try! I love the rosehip oil to! My story is exactly the same as yours, started when I was pregnant and quickly became addicted. I love it, too … so does the cat as she tries to lick my face the second that it is applied. …ebates.ca for those of us in Canada!!!! Hi! I’m wondering if you have used this on your baby? My baby has really dry skin (possibly eczema) and nothing seems to help it. Would you recommend using rosehip oil on his skin? I’ve read it can be used on babies but also read not to use it on babies. Also- how many drops do you use on your face? I have tried certain lines like juice beauty – they smell really nice. For an oil, I have been using “Marula oil” from Acure organically. Which was purchased on Amazon. I like it a lot and sometimes mix it with mousurizer! Ohh I looove oils as moisturizers! A favorite of mine? Extra virgin olive oil…that’s a winner for sure. I had a time when my face felt so dry it was itchy and red…agh horrible! That stuff worked wonders for me. Hello, thank you for the interesting and informative article. I have one question, please. Is it safe to use this rose oil during summer for people with melasma and hyperpigmentation? Thank you.